30" x 12" x 8"
Here Chickadee was commissioned by Chickadee Restaurant in Boston, Massachusetts. I was asked to create a nest for the walls of the restaurant. Chickadee nests are densely packed and look like balls of grass and cotton. I decided that instead of making a chickadee nest literal in form, I would carve a form in which a chickadee would nest if one were to fly into the restaurant. There Chickadee is a carved egg commissioned by Chickadee Restaurant in Boston, Massachusetts. The Chef and Owner has a young daughter named Maple. 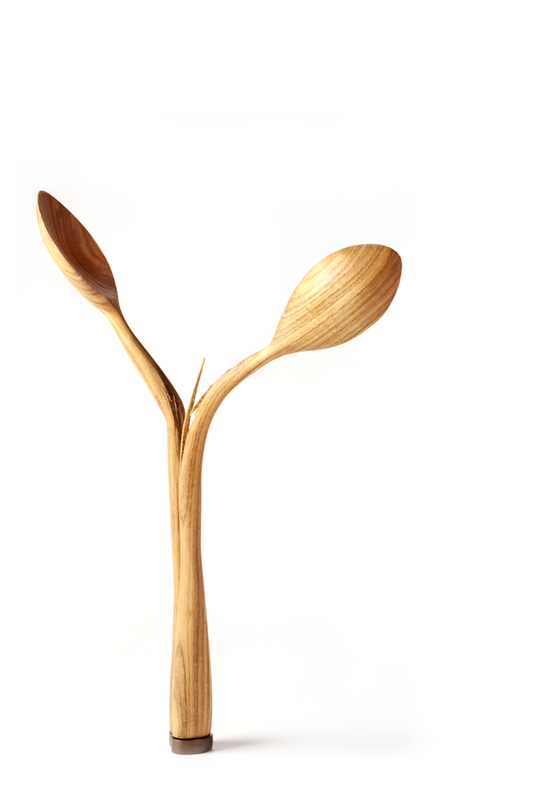 When the asked for an egg, I knew I had to make the piece out of maple wood. I wonder if as she gets a little older, Maple will stare at the maple egg hung on the wall of her father's restaurant and begin to question her origins. 5' x 2.5' x 6"
While We Were Underground tells the story of a power struggle between two carrots. What at first appears to be a loving relationship, is in reality a competition for space, a fight for survival. 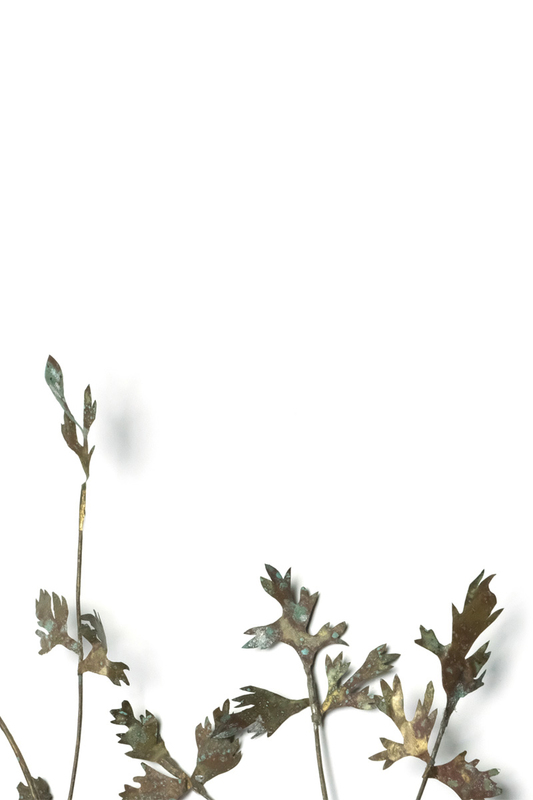 The carrot on the right grows a little thicker, flicks a mere foot in the direction of its companion, and otherwise holds its ground. The carrot on the left wastes energy wrapping around and around its partner in an effort grow, perhaps to strangle, to find a space of it’s own. This carrot’s entire shape becomes determined by the stronger carrot. Viewers are quick to interpret the story of intertwined carrots as a story of love, without much consideration to what really happened while the carrots were underground. 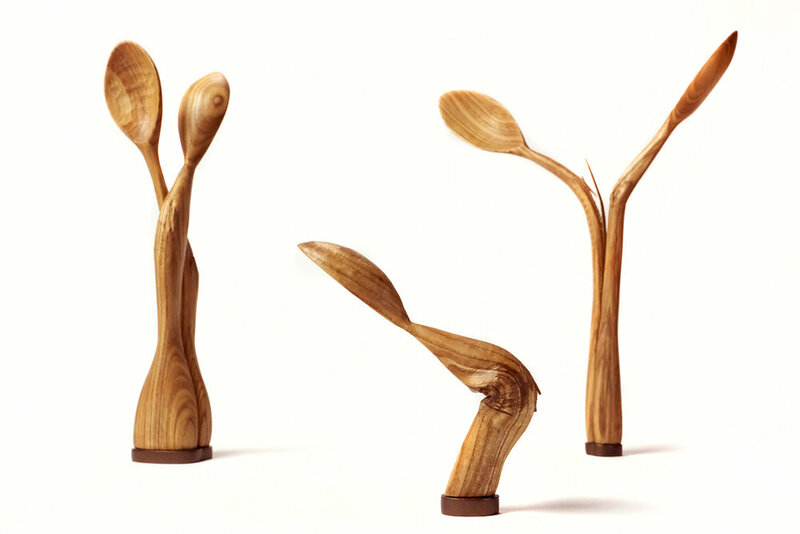 Each spoon has been free-form steam bent to the point of cracking, but not breaking. After years of creating celebratory work about my life in agriculture, I began to speak more critically about the stressors of an industrialized food system on our soil, bodies and politics. 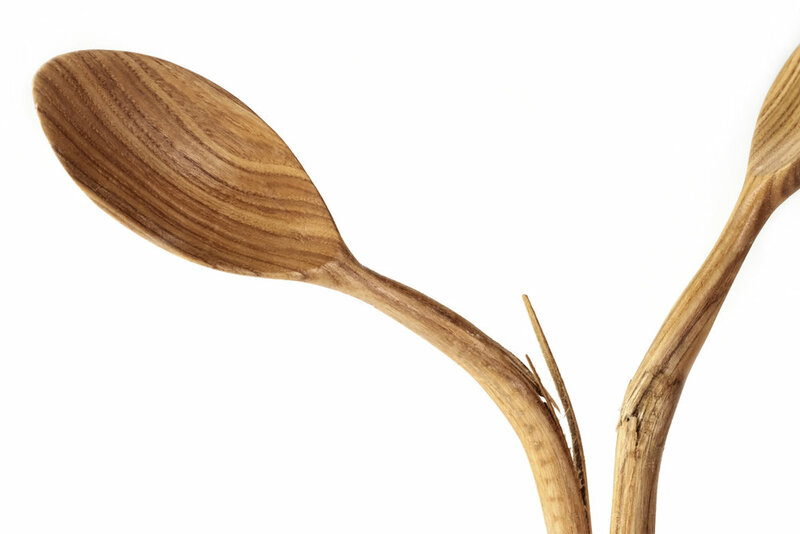 These stressed out spoons show signs of wear, appear to have stomach and back aches, and aim to personify the demons present in our agricultural practices in the US. 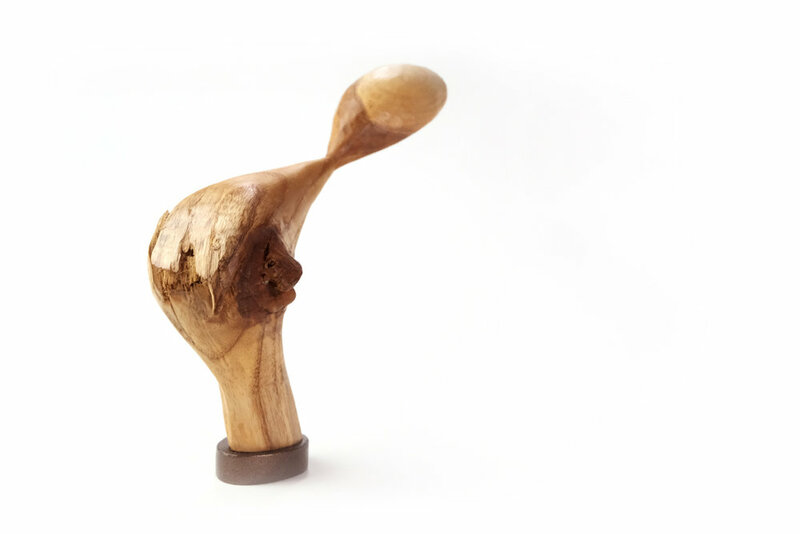 Created as part of a meditative clay pinching practice, with focus on the idea of letting emotional stress spill away. After spending time carving signs of distress in wood, I began to consider how to express a feeling of deflation through form. Wood did not feel like the appropriate medium to express deflation in. I took to clay, a medium that I could fill with air before popping or deflating. I pinched these forms, then carefully pushed pockets of air out of them before firing them into a frozen state of partial deflation. 6" x 6" x .75"
A ceramic painting of a parsnip field in the wintertime. The golden flecks are representative of the sugars that develop in overwintered parsnips as a self defense mechanism against the cold.